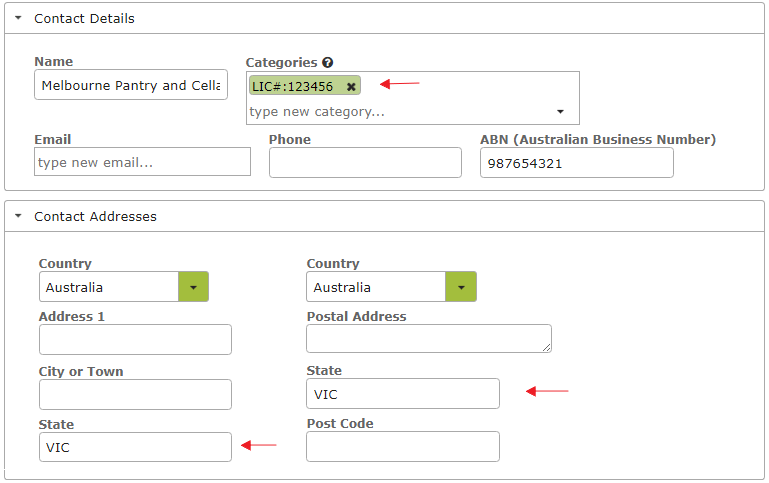 Go to Contact Categories in the Settings area of People and Companies (Contacts) and create a new category. The category name should be a short abbreviation eg “LIC#”. Un-tick the “Remember Values” tick box so you are not restricted to any options listed there. Go to Product Categories in the Settings area of Inventory (Count) and create a new product category for each State that requires reporting. In the ‘Values’ area, list all the categories required by that State, separated by semicolons (;) as in the example below. Note: This information was entered at the beginning of August 2017 and could change. We did not find reporting requirements for Australian Capital Territory, New South Wales, South Australia, Tasmania and Queensland. Please email us at support@vinsight.net if you are aware of any other reporting requirements we could include, or if you believe any of this information is out of date. 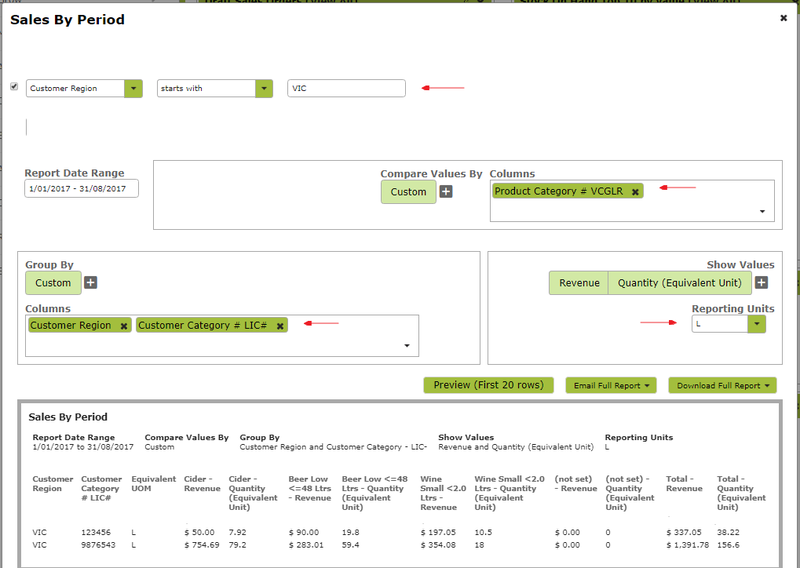 Add the relevant product categories to each Stock Item that you sell into that State. In the following example we are setting up the 17 ABC Chardonnay Magnum for sale to retailers in Victoria and Western Australia. Now you should be able to run the Sales By Period Reports to highlight the sales you are interested in. Ensure you filter for Customers in the relevant State. Set ‘Reporting Units’ to convert sales to litres or any other common unit. Use ‘Custom’ Grouping to group by and display the Customer’s License Number. You can download this report to a spreadsheet to manipulate it further and ensure it is in the format required by the particular State. Click on the sales report below to view larger image.